Due to the increase of Samsung smart TV sales, we have been fortunate to install and provide you our personal experience with our Samsung Frame TV Installation. Last week we installed our second Samsung Frame TV, this time onto a brick fireplace. This 55-inch Samsung Frame TV came without the 4 standard mounting holes in the back so we had to use the Samsung frame TV wall mount supplied by Samsung. 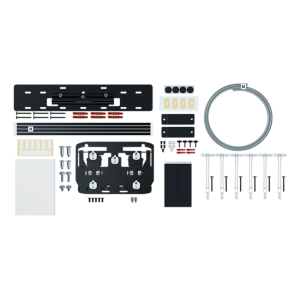 The Frame TV wall mount easily attaches to the back of the tv with the small screws supplied in the kit. 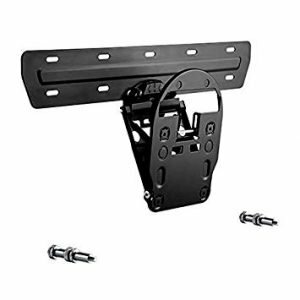 The wall mounting bracket easily attaches to the tv by sliding onto a rod and snaps into place but there is no room to slide the tv left or right after putting the tv onto the bracket. The wall mounting bracket comes with several holes to attach to the studs or mounting surface but as a professional installer I can see the inexperienced or do it yourself tv installer having problems centering the tv perfectly on the wall, particularly a stone or brick fireplace where the lines may not be even. If the bracket holes don’t line up perfectly to catch two studs, (which most times they won’t), an inexperienced installer will be forced to mount the tv off center for stability. 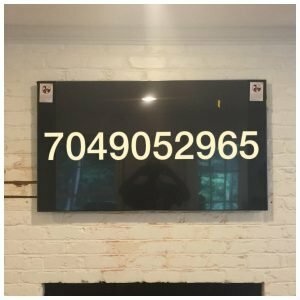 We were able to use a tape measure to convince our customer that their Samsung Frame Smart TV was perfectly centered but he was smart enough to see the potential problems for himself. The first Samsung Frame TV installation we did was a 65 inch 4k TV over a prewired fireplace. The TV came with the 4 standard mounting holes in the back so you can use a standard wall mount over the Frame TV mount to make installation easier but our customer insisted that we use the Frame TV mount. Samsung also supplied 2 spacers with the mounting kit to space the bottom of the TV away from the wall. Our customer wanted the TV completely flat on the wall as he had seen in several Samsung Frame TV installation videos on You Tube. The problem with this was the One Connect box, the length of the One Connect cable, and the lack of a recessed AC outlet. Since the fireplace was pre-wired and the One Connect cable was not long enough, the One Connect box had to go behind the TV to connect to the cable box to the pre-wired HDMI port. The pre-wired HDMI port along with the AC outlet made the TV have to sit about an inch or two from the wall. We used the 2 spacers to balance and level the TV. The only way to have the Samsung TV sit completely flat on the wall with its supplied wall mount is to run the One Connect cable inside the wall and install a recessed AC outlet. 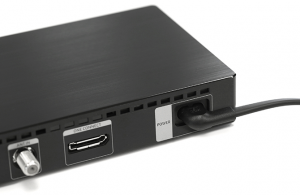 The One Connect box and the Samsung Frame TV both require power. Both power cords have 90 degree bends at the end but will make the TV sit awkwardly away from the wall if plugged into a normal AC outlet. Since the One Connect cable is so thin and expensive, running it in the wall should be avoided or done with extreme care. 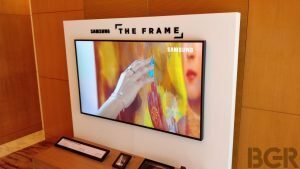 I suggest having your Samsung Frame TV installation performed by a professional tv installer to avoid damage to the TV and cables and ensure that it is installed securely and exactly where you want it for years of enjoyment. Contact us for professional help with your Samsung Frame TV Installation!